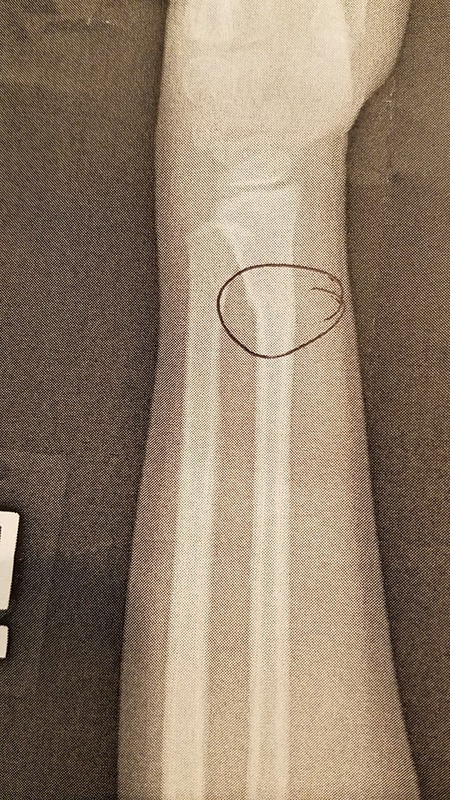 Last August, my younger son broke a bone in his foot in a freak playground accident during his kindergarten year. At the time, we thought a hard cast on the leg of a 5 year old boy was going to be really tough. We were right. It was really hard, but what surprised me the most was how resilient he was! He not only didn't complain about his foot, he didn't let it stop him. Now that his older brother who is 7, has broken his arm at the very beginning of summer vacation, I feel more prepared in dealing with this "lemon" of a trial. This was my little guy the day he had his cast put on. 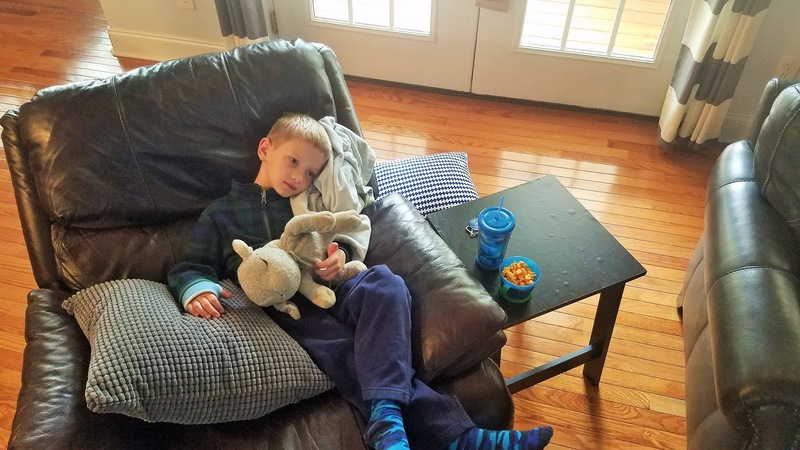 I did all the motherly things I could think to do for him: brought his beloved snack, his preferred drink of ice water, gathered his Buddy (blanket) and Lamby, put a movie of his choosing on the TV and proceeded to sit across the room from him and watch his every movement for the next hour. That's normal, right? You see, I was concerned about the break. 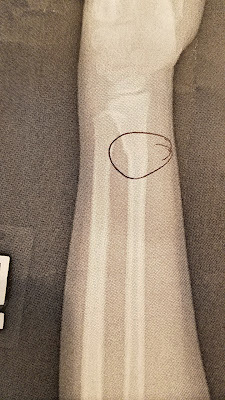 While, you can see clear as day the bone that is broken in the x-ray above and how it slightly shifted, creating an imperfect alignment, what you can't see (what I couldn't see) is the spirit behind the face of the boy with the break. I was concerned about the break; the breaking of the spirit. 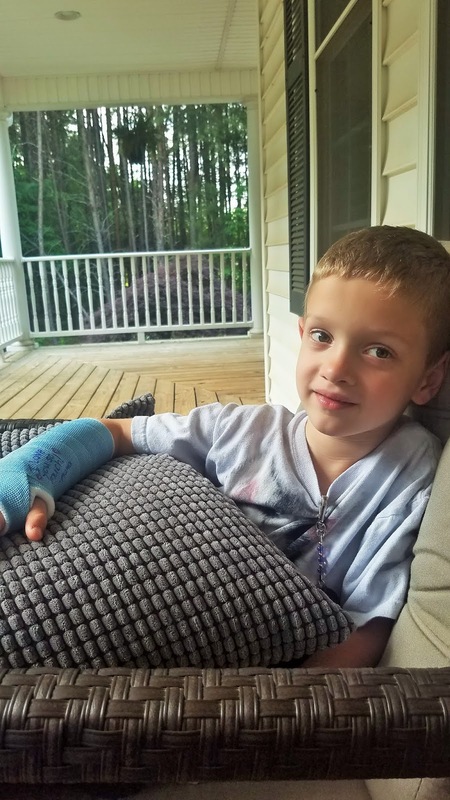 My boy broke his arm on Mother's Day. He broke his arm on his mama's birthday. Two of my favorite days and days that are essentially, usually all about me and happen to fall on the same day sometimes. 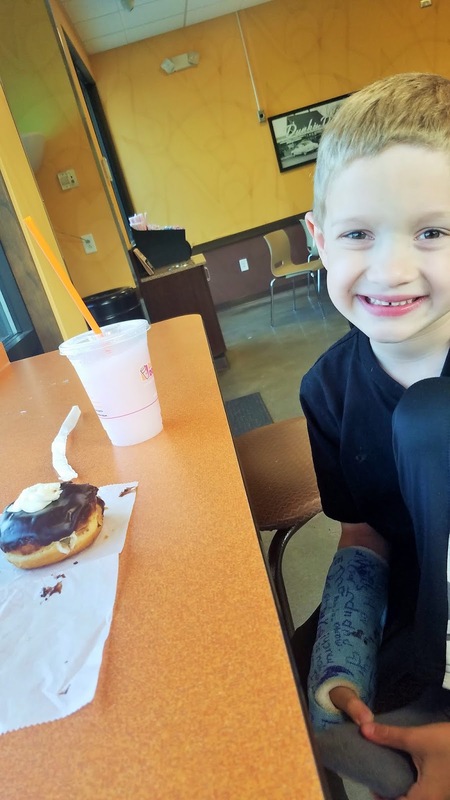 Knowing my son and his compassionate spirit, I had some reasons to be concerned. The school year was just ending and summer break was a couple of weeks away. There were some really exciting events coming up with all of the "end of school" activities, award ceremonies and parties. We had a scheduled beach trip planned just as school ended and a community pool membership calling our names! 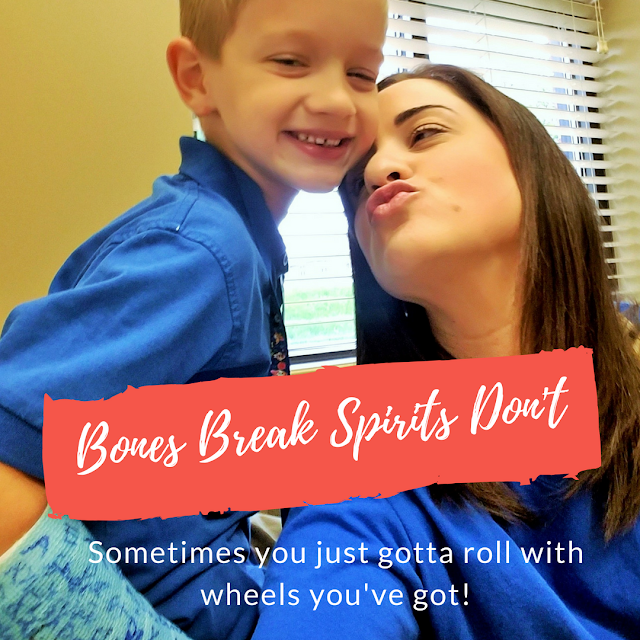 Not only did my boy break his arm on his "mama's days" but he broke his arm at arguably one of the worst times of the year. So now knowing all of that information, you can understand why I needed to be sure my son, who is sensitive yet very much in control, was not breaking down inside. I talked to him. On this particular day in the photo, we sat on the front porch together when the weather was cool enough to bear without grimacing, and we talked. There were 3 pictures I took of him in this moment. The first two, he didn't know I was taking and he looked very sad. Then he looked over at me and just as he does, he smiled for me to let me know that he was ok. He smiled for me, to make ME happy. This wasn't exactly what I wanted in that moment. So I put the phone down and we talked. I asked him if he was doing ok. I asked him what he was most worried about or sad about because of breaking his arm. He shared with me that he was doing ok and that he didn't like his cast and just wanted it to be off. He shared that his arm was really hurting. I did my best to talk him through what the next 4 weeks would look like and how we would still have an amazing time, even with a cast. Before long, I started to see the genuine smiles coming more frequently. The smiles that weren't just for mama taking a picture but were coming from being truly happy. As the end of school drew closer to an end and the space on his cast became almost non-existent, my big 1st grade boy showed us that his joy was not lost. Through the pain and the changes, his spirit was unmoved. We went out for special treats, played lots of indoor games together as a family, took a special trip to 5 Below and involved him in many activities! This arm breaking business was going to be ok after all. At the end of the year, our school gives out character awards which is something that I think all of us parents really appreciate. 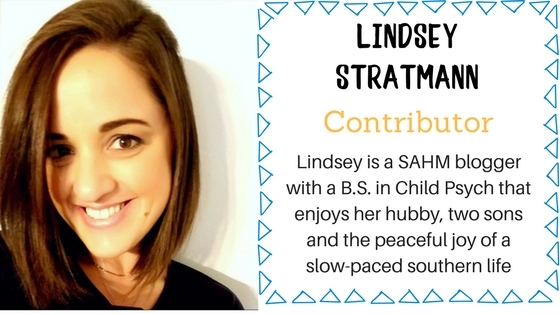 Not only do we appreciate these types of awards, but we appreciate our teachers taking the time to recognize and nurture these character traits within our children. It's really special to me to know their spirits and their character are being looked after while they are away from me during the day. At his awards ceremony, I really didn't know what award he would be given. 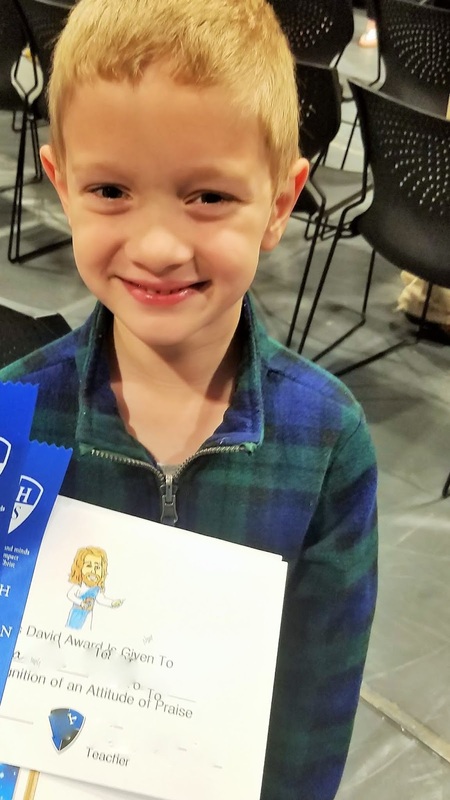 Last year, during his kindergarten awards, he was given the "Good Samaritan" award which I think is pretty self-explanatory but just in case it isn't, it's an award for helping and uplifting others. This year, at the end of 1st grade, with a broken arm about to disrupt his summer plans, I really didn't know which award he would be given. What?! Attitude of Praise!? This was so encouraging to this mama's heart. Not only was my boy's spirit not broken, but he still managed to care for others in the midst of his own struggle. I am constantly learning things from children (not just my own). The way they persevere in life is unlike anything we can learn from another adult in life. They have yet to be jaded by a lifetime of trials. They still see the good! I'll be the first one to raise my hand and say that I wish I could be more like this and it's something I really am working on. If I bring any light to your day (and it's needed here in North Carolina with the recent summer rainfall we've been experiencing), I hope it's through the spirit of a little boy who had an unfortunate thing happen to him at an unfortunate time but hasn't allowed it to break him. If you have felt encouraged, share it with me. Pass it to someone else. Share your encouragement and do not keep it bottled up. There is so much in this life that is doing it's best to bring us down, but what if we all decided we would make it our goal to lift one another up? Whether it be a compliment, a helpful hand, a hug, a word of encouragement or even just a smile, share it! Will you? Do it for me. Do it for the boy with the broken arm who somehow does it for me every single day. What a beautiful story of resilience.